Haggling with Cairo’s aggressive taxi drivers can spoil anyone’s day. Skip the transport hassles and enjoy pickup and drop-off direct to your door on this private, half-day tour. 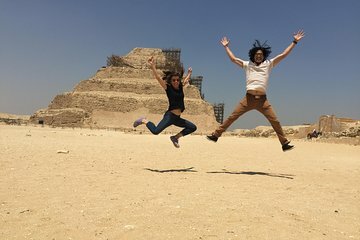 Exploring with your own personal Egyptologist, visit the city of the dead at Saqqara, home to one of the nation’s earliest pyramids, the Pyramid of Djoser. Then continue to Memphis, once the capital of ancient Egypt. Please note: Tour excludes entrance fees.